Here is a case of a typical Dartmoor confusion – I’ve seen Sanduck Cross – which one? The old ancient cross or the road ‘T’ junction called Sanduck Cross? In this particular case the old ancient wayside cross which sits in the hedgerow near Sanduck Farm. To begin with how did the name Sanduck come about as it certainly had no connection of the avian type? In the Lay Subsidy Rolls of 1333 there was a small farmstead called Sandhulke which over the centuries has been corrupted to the modern day farm of Sanduck. It has been suggested that the original place-name was formed of two elements – Sand and Hulke. The first element is fairly obvious but the second has derived from the old Anglo Saxon word Hol or Holoc which means a hollow or hole. This then gives us ‘the sand/sandy – hollow/hole/’. So as far as the cross is concerned this has taken its name from the Sanduck farmstead along with the crossroads, nearby woods and grove. The ancient cross which today sits patiently on the roadside has literally risen from the ashes like the fabled Phoenix. In the April of 1901 Sanduck Farmhouse was unfortunately burnt to the ground. A newspaper report detailing the proceedings of the Newton Abbot Rural Council of July 1901 included a proposal from the Rev. W. H. Thornton of North Bovey which read; “He (the Rev. Thornton) was deeply interested in ancient monuments. Sanduck Farm, Lustleigh, was recently burnt down and on taking down a parting wall there was found a handsome old cross which had formed part of the foundation of that wall for over a hundred years or more and from its appearance he should say it was several hundred years old. The Hon. W. F. D. Smith had given it to him and he had had it repaired. Therefore he asked the Council if they would grant him permission to erect the cross on a piece of waste ground in the North Bovey parish. The council would be put to no expense for the cross. Mr. Ford proposed that Rev. Thornton be granted his request. This was seconded and carried.” – The East and Devon Advertiser, July 13th, 1901. Some 43 years later another article concerning the cross appeared in the Western Times, this one said; “Parson Thornton, of North Bovey, in one of his books, tells how the old Sanduck farmhouse was burned down in April 1902 (??? ), and how the cross with one arm missing was discovered at the base of a wall inside the house. How long it must have lain there is a mystery, but the room where it was found showed traces of great age. I have also heard that the cross was actually found under the front doorstep (???). As to where it originally stood is also a mystery but I take it that it is possible that a builder many years ago found it lying about and used it as an extra foundation for an inside wall. However, a clever stone mason was commissioned by Parson Thornton, and he has executed a fine piece of work by fitting a new arm; and the other evening in an excellent light I failed to find any trace in the joint of the arm where it is fixed to the head of the cross.” – Arthur Wilde, The Western Times, July 28th, 1944. So from the two accounts there are a couple of points of confusion, I think it can be taken as read that the farmhouse burnt down in 1901 and that the cross was found amongst the foundations of a wall. 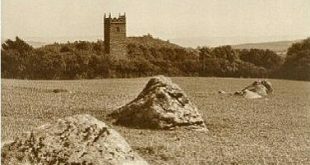 According to William Crossing the owners of Sanduck Farm were attending the annual harrier hunt on Bellever Tor when the fire broke out apart from that he had very little else to say about the cross apart from confirming it happened in 1901 and the cross was found amongst the foundation. p.160. Today the cross stands at a height of 1.24 metres with an arm span of 36 centimetres along with a shaft circumference of 88 centimetres. The arms are aligned in a North East to South West direction, Sandles, p.86., it is the north eastern arm which was the replacement expertly fashioned by the stone mason. Although mostly buried today the socket stone in which the cross sits measures 1.08 metres long and is 0.23 metres deep. As can be seen above, clearly the ravages of time have affected the cross and it needs the support of the venerable Ash tree under which it shelters. Several early photographs of the cross in its former days of glory can be seen on the Dartmoor Archives website – HERE. The general consensus is that the cross dates back to the late medieval period and acted as a wayside cross on the road from Lustleigh to either North Bovey or Moretonhampstead. “The cross stands by the road near Sanduck Farm, but probably not exactly in its original position, for this is another waymark that has been unearthed this century. It was discovered among the foundations of the farm house after this was burnt down in 1901. One suggestion is that the cross was hidden, perhaps during Puritan times and then forgotten.” – J. Hayward, Dartmoor 365, p.134. What Hayward was alluding to with regards to the Puritans was the fact that back in the 16th/17th centuries they regarded the ancient crosses as Catholic idolatry and ordered that all such should be destroyed. Across the country many stone crosses were smashed and knocked down but in some cases those who were tasked with their demolition refused to do so either out of religious respect or superstition. In such cases the crosses or their remnants were hidden in building, foundations, enclosure walls and bridges for safe keeping and a fair few cases have been rediscovered on Dartmoor. On the other hand this and some of the other examples could simply have been utilised in such structures as a handy source of building materials with no regard for their religious significance. Incidentally if you are wondering why there is an image of a farmer and his sheep in the page header it’s because today Sanduck Farm plays host to sheep dog trials. Actually, it is Sanduck Cross Farm – (the modern farmhouse), where sheepdog trials are held.